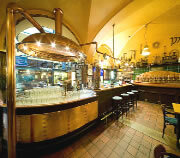 Many pubs in Prague are set in historic buildings, where the dramatic history of the city permeates the atmosphere. From cellar bars and beer halls to early 20th century cafés, this is our pick of the best bars in historic settings! 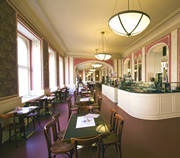 Café Louvre in Prague is a Parisian style café and billiard hall dating from 1902. This 'crowning jewel of Prague café culture' is a pleasant place to while away a few hours, with a coffee and cake, or over a game of billiards with a cold beer. In its early years Café Louvre attracted such well-known visitors as Karel Capek, Franz Kafka and Albert Einstein. 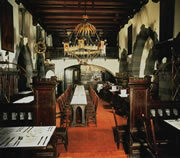 U Medvidku is a traditional Czech beer hall style pub. It dates back to 1466, and has brewed its own beer ever since. This is a straight forward Czech pub, with various drinking areas, and it is large enough to accommodate several hundred people. U Medvidku is a unique pub in Prague in that it has kegged beers, bottled beers, an onsite microbrewery and tank beer. Nebe Kremencova is located in restored medieval cellars. 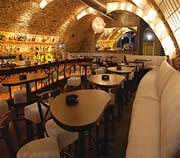 It is furnished in a contemporary style, with walnut coloured tables and a gleaming backlit bar. The music at Nebe varies from r'n'b/house to 80s/90s/00s/10s pop, and as the night progresses people gravitate towards the dance area. Popular with local Czech's and the International crowd. U Sedmi Svabu is an olde medieval style pub in the Lesser Town (Malá Strana), not too far below Prague Castle. 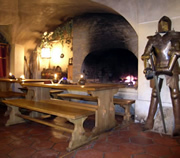 In keeping with the historic feel of this area of Prague, U Sedmi Svabu has a roaring fire, suits of armour, stone walls and some cast-iron decor. It's dark and atmospheric, with tables lit by candlelight.